Tomas Bryllert was born in Växjö, Sweden in 1974. He received the degree of M.S. in Physics and the Ph.D. in Semiconductor Physics from Lund University, Sweden in 2000 and 2005 respectively. In 1997-1998 He spent one year at The University of Waterloo, Ontario, Canada as part of the Masters degree. During 2004 he worked as a guest researcher at the Microwave Electronics Laboratory, Chalmers, Sweden developing frequency multipliers. Building on his research done at Lund University he developed key technology for the company Qunano AB (www.qunano.com) during 2005, (2 patents pending). Starting 2006 he joined the Physical Electronics Laboratory at Chalmers where the main research interest is device and circuit technology for THz frequency multipliers. 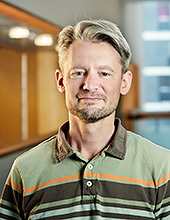 He is also co-founder and CEO of Wasa Millimeter Wave AB (www.wmmw.se), which is a spin-of company from Chalmers developing and fabricating mm wave products. In 2006 Dr. Bryllert was awarded a research fellowship in “cross- disciplinary micro/nano science” from the Wallenberg foundation. As a result of this he is presently on leave doing post doc work with the Submillimeter Wave Advanced Technology (SWAT) group at California Institute of Technology/Jet Propulsion Laboratory, Pasadena, USA. There might be more projects where Tomas Bryllert participates, but you have to be logged in as a Chalmers employee to see them.